Oops - we don't appear to have a video for the GT-S55. 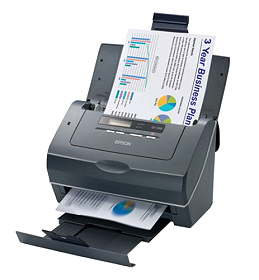 Increase the productivity of your document management system with this fast A4 sheetfed scanner. Reliable and easy to integrate, it is ideal for businesses needing to convert large-volume documents into high-quality electronic files, while network connectivity means it can be shared across the office. The GT-S55N scans up to 25 pages per minute in simplex or 50 images per minute in duplex, in mono and colour, at 200dpi. Double-sided pages are scanned in a single pass, while a 75-sheet automatic document feeder is perfect for large-volume jobs. Designed to fit seamlessly into virtually any document management system and workflow process, the GT-S55N is fully compatible with complex IT environments. It also comes network-ready for sharing between multiple users. Epson ReadyScan LED technology means no warm-up time and lower power consumption, reducing costs and environmental impact. The GT-S55N is also a mercury-free product, making it more environmentally-conscious.